Research Scientist: AMRIT seeks a research scientist to work on collaborative projects in Berkeley, California to acquire and analyze a variety of MRI data at both 3T and 7T scanners and develop new software applications in structural, functional and physiological MRI. Requires a Ph.D. in Neuroscience and 2 years of research experience, including analyzing fMRI data with Matlab and FSL software; operating 7T MRI scanner; pulse sequence optimization skills for removal of image artifacts and k-space coverage; 7 Tesla skills involving rf coil optimization and proposing changes in coil designs; conducting research in quantitative physiological imaging with MRI pulse sequences and evaluating their acceleration with multiband imaging for arterial spin labeling measurement of brain perfusion; applying blood volume (VASO) brain imaging; fluid dynamics modeling of mr velocity imaging. Research Scientist: AMRIT seeks a scientist / MR physicists at the PhD level with substantial experience in pulse sequence programming and C++. 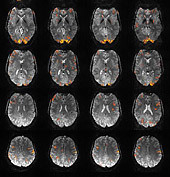 Previous work on Siemens MRI software is desirable. AMRIT has a number of collaborations with universities and several N.I.H. funded research projects, development contracts and innovative research in pulse-sequence software and MR technology. Fax to: 707-829-2966; no calls.